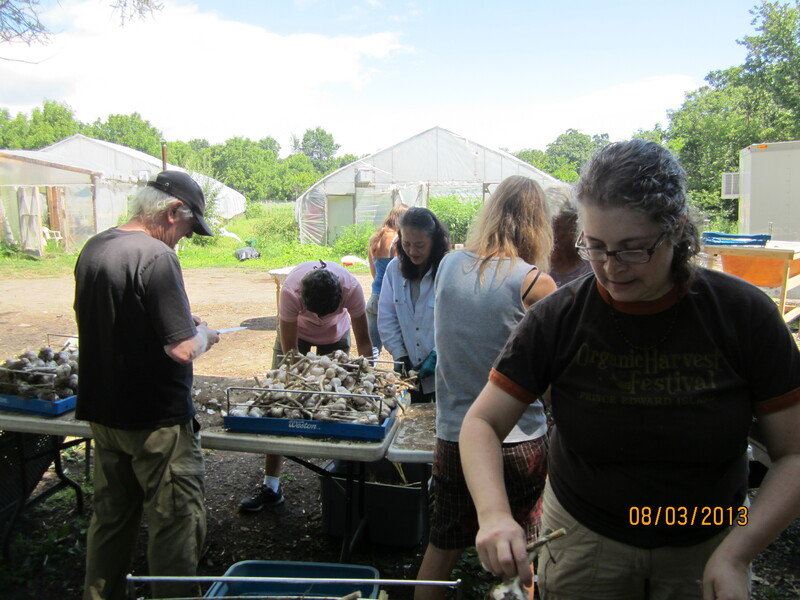 Today I had a wonderful morning cleaning up garlic that had been harvested at Zephyr Farm. They planted 9000 bulbs of garlic and we were a group of 10 volunteers who attempted to make a dent in cutting off the stems and roots of the garlic harvest. Two summers ago, I volunteered on a farm, assisting for the CSA harvest every week on Jen and Derek’s Farm in PEI. I had started becoming interested in where my food came from when I lived in Winnipeg and when I was gigging in Charlottetown, I discovered the farmers’ market and it, among many other things, helped me fall in love with PEI. I loved knowing my farmers, being able to chat with the people who grow my food every week and being able to thank them directly. I loved knowing that I was eating food that had only travelled 10s of kilometres before reaching my plate (yes 10s, it’s a small Island). I’d prefer to eat that way all the time. In PEI, I did, all year-long. There were some things that I was unable to get from the Island, flour, grains, oil, spices, etc, but at least 80% of my food was local. A locavore’s dream. As I write, I have dirt under my nails, I am a little tired from spending my morning in the sun, working with a group of people. We got to take a tour of the farm, which was lovely. We were also treated to lunch. I miss spending time on a farm every week. I think I have to do something about that.